Wash and pat dry whole chard leaves. Heat a large sauté pan with a lid with olive oil until shimmering then add the chard in whole (in half moon shape), lemon juice, salt and red pepper flake. Cover with lid and cook for 2-3 minutes, until wilted but still has a little firmness. In a small skillet heat on medium-low with the pine nuts (no oil necessary) and shake or stir pan every couple of seconds until they start to get golden brown. 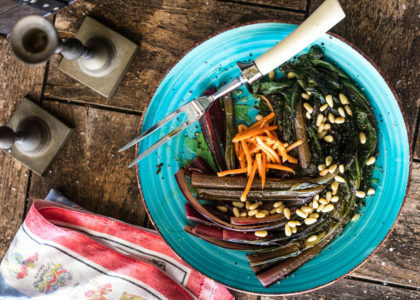 With tongs, pull the chard from the pan and top with the roasted pine nuts (you can also substitute crispy bacon bits or pepitas). © 2018 | Let's Taco Bout It Blog. All Right Reserved.